CONSUMERS: CHECK BEFORE YOU HIRE! Click here for a listing by county of Non-Compliant Businesses. These Businesses are not in compliance with the Law. It is now mandatory to hire a tree care business (In-State or Out-of-State) that is registered with the State Board of Tree Experts and has employed a Licensed Tree Expert or Licensed Tree Care Operator depending on the services they offer for hire. It is important to make sure that the company is qualified to do tree work and fully insured in case an accident happens. Incorrect tree work can predispose your trees to many future problems, including tree failure. In addition, many homeowner policies will not cover injuries or damage done by an under-insured tree care contractor, which may leave the financial burden on the homeowner. Click here to go directly to the Directory of Licensees and Businesses that are in compliance with the Law. The NJ Department of Agriculture has issued a quarantine for Mercer, Warren and Hunterdon counties to prevent the spread of the Spotted Lanternfly. Under the quarantine, households and businesses that transport certain outdoor articles must obtain and fill out a checklist before moving any of the listed items. In addition to the checklist, businesses that routinely travel in and out of the quarantined counties have training requirements with which they must comply. All Tree Care Businesses and Licensees are required under N.J.A.C. 7:3A-2.16 to cooperate with quarantine restrictions. Registered Businesses and Licensees shall cooperate fully and adhere to all mandated restrictions. Any business or licensee that fails to cooperate or adhere to such restrictions shall be in violation of N.J.S.A. 45:15C-20 and subject to penalties under the Tree Expert and Tree Care Operators Licensing Act. The following dates are for written LTE and LTCO Exams only. This exam includes the written exam for LTE and LTCO as well as the field exam for LTE. The deadline to use and apply for the Licensed Tree Care Operator's (LTCO) "grandfathering licensing" (7 years of experience) is APRIL 13, 2018. After April 12, 2018, the grace period for LTCO Licensing by grandfathering will expire and the Board of Tree Experts will no longer accept "LTCO grandfathering applications". An LTCO license can still be obtained by examination or through LTCO Reciprocity. The Board of Tree Experts will start to implement on APRIL 13, 2018, the LTCO written exam fee of $100.00, the LTE written exam fee of $100.00, and the LTE field exam fee of $100.00. These fees are in addition to the license application fee of $50.00 submitted when applying to take an examination. Once the Board has qualified the individual to take the license examination from the exam application, that individual will be invoiced the exam fee(s) noted above and payment must be received prior to the examination date to sit for the exam. These fees were approved in the adopted rules of April 17, 2017 and are now being enforced. The Deadline for Business Registrations was September 14, 2017. Please use the Business Registration Application to apply. Please note that the Board may issue civil penalties (click here for list) of up to $1000.00 for the first violation of 7:3A-9.6. for "engaging in the business of providing tree care services for hire in New Jersey without first registering with the Board." A late fee of $25.00 will be charged to a business that files for a registration on or after January 1, 2018. The Board of Tree Experts votes at its July 12, 2017 meeting that, TCIA's Tree Care Safety Specialist AND Tree Care Specialist credentials together, are equivalent to the Licensed Tree Care Operator (LTCO). Use the 2018 License by Reciprocity Application (fill-in version) or 2018 License by Reciprocity Application (static version) to apply for the LTCO and include a copy of the certificates of both credentials as evidence. Remember to include the application fee too. The Board of Tree Experts votes at its June 20, 2017 meeting that the ISA Certified Arborist (CA) is equivalent to the Licensed Tree Care Operator (LTCO). Use the 2018 License by Reciprocity Application (fill-in version) or 2018 License by Reciprocity Application (static version) to apply for the LTCO and include a copy of your current CA certificate or CA card as evidence. Remember to include the application fee too. The Tree Care Industry Association is offering a discount on items that are useful for companies in New Jersey needing help with compliance with the new LTE/LTCO law. Illness & Injury Prevention Program — has a safety policy designed for the tree care industry. Tailgate Safety Manual — has individual safety training session for the tree care industry. 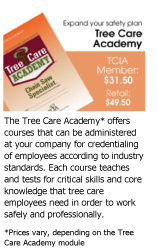 Tree Care Academy — offers on-site training for credentialing with TCIA. The New Jersey Board of Tree Experts has a deadline of April 12th, 2018 for existing businesses with at least 7 years' experience to be "grandfathered" into the Licensed Tree Care Operator's (LTCO) program. Once accepted, the business has 90 days to make and present their company safety plan to the Board, including proof of employee safety training courses. TCIA is offering discounts on our training products to help your organization meet the requirements and ensure you keep your employees safe! Additionally, the Tailgate Safety manual, the Illness & Injury Prevention Program, and the Tree Care Academy modules will help you meet the 32 hour CEU requirement for the LTCO program. These discounts are only available to companies who operate in New Jersey. You don't have to reinvent the wheel - let TCIA help you build your organization's safety program! On Monday April 17, 2017, the New Jersey Register posted the New Jersey Board of Tree Experts' rules, setting standards for professional practices, qualifications for Licensed Tree Experts (LTEs) and Licensed Tree Care Operators (LTCOs) and the registering of tree care businesses. Click on the links below for a copy of the Tree Expert and Tree Care Operators Licensing Rule and the Certificate of Adoption and Promulgation. Please return to this website periodically, as new updates will occur daily. Updates to this site will contain the information, forms and instructions you will need to participate in the Tree Expert and Tree Care Operators Licensing Law and the newly adopted rules. The Act re-establishes a “Board of Tree Experts” in the DEP with increased membership from 3 to 9 members. The Act establishes minimum qualifications to take the examinations and identifies specific tree services that each title can perform. The Act requires that at least 1 person in each company hiring itself out to perform tree care services be licensed. The Act requires minimum continuing education units be earned prior to re-issuance of the license. The Act requires businesses provide instruction and training on safe use of equipment and safe working procedures at the work site and document this training to the board. The Act requires tree care businesses to carry minimum levels of liability insurance and to provide proof they are adhering to workers compensation insurance rules. The Tree Expert & Tree Care Operator Licensing Act was passed on January 16, 2010, to protect the public and make the tree care industry safer. Download a PDF copy of the Tree Expert and Tree Care Operators Licensing Act. Due to changes within the industry, including the workforce and machinery utilized, a need was identified to protect companies and consumers from avoidable accidents. The licensing legislation was proposed by industry groups and passed by the New Jersey legislature on January 16, 2010. The legislation is known as the Tree Expert and Tree Care Operators Licensing Act. A Licensed Tree Expert (LTE) is a person who has been examined and proven to be competent in the science and art of diagnosing, treating and preventing tree injuries. These professionals demonstrate high ethical and moral standards in the practice of tree care and are licensed by the New Jersey Board of Tree Experts. LTEs produce correct, long-term management techniques required in the science of tree care. Licensed Tree Experts must obtain continuing educational credits over their licensing period, thereby insuring LTEs are up-to-date on new information, skills and techniques in the tree care profession. In 1940, the State of New Jersey authorized the creation of the Board of Tree Experts to develop a professional examination for individuals with arboriculture knowledge and background. The Board has been awarding the Certified Tree Expert (CTE) credential since that time and it was the only credential recognized by the State for those individuals working in the tree care industry. From 1940 to 2016, 640 individuals were certified as Tree Experts. This certification was voluntary, not mandatory and the Board had found that those individuals that take and pass the test were among the most knowledgeable and ethical arborists in the state. Because of the qualifications and integrity of Certified Tree Experts, it was unlawful to promote or advertise oneself as being certified if they did not hold the CTE credential. Starting April 17, 2017, with the adoption and promulgation of the Board of Tree Expert's Rules, full implementation of the 2010 Tree Expert and Tree Care Operator Licensing Act can occur. Current Certified Tree Experts in good standing with the Board will be converted to Licensed Tree Experts. The Board will start to Register Businesses and bring Tree Care Operators into the Licensing program as well.